The view from our first hotel, two stories from the very top. I’m finally back from a week away in Florida, and I have to say I’m ready for a vacation. I over planned things a little too much, and ended up with a very fun week that also managed to drain every bit of the energy from my body. By the 4th day in Florida I was lying in bed, moaning in horrible pain as something like a stampede of elephants happily pranced through my forehead. I recovered in time not to ruin the day, but it’s telling that I was essentially having a hangover when I wasn’t drinking alcohol. The trip had two main purposes, finding an apartment and recovering from the chaos that is Nicole and I’s life. On count one, we didn’t find any actual dwelling places, but we did manage to explore a lot of places and find where we might want to inhabit. On count two, we definitely didn’t recover or relax, as I’m still nursing a constant headache and a distinct inability to wake up in the morning, and Nicole is suffering from some monstrous cold. Still, we enjoyed ourselves, and in the end that’s all that matters. During the whole hectic affair, we managed to take a combined 900+ photos, chronicling highways, beaches, amusement parks, hotels, and lots of random birds and lizards. As such, I haven’t even begun to delve through the mess, and still need to sort all the pictures into something coherent and non-blurry. It will probably be at least a week before I get to the detailed recapping of our adventures. Until then, here’s a breakdown of our trip, including the breakdowns. Think of it as a preview. Sometime in the morning before the sun or my brain rises, Nicole and I receive a ride to the airport and fly to Orlando. We check into our hotel, then make our only stop at anything Disney. When Downtown Disney is literally across the street from your hotel, how can you resist? Nicole sleeps in some while I do a little work, before we drive off to Winter Park, a college area and ritzier suburb of Orlando, where we listen to 20 something women at the next table discuss plastic surgeries while we try to eat at Cheesecake Factory. 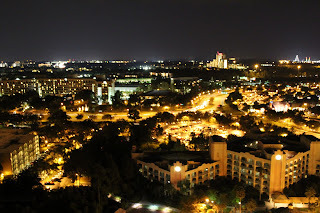 We then go back to the hotel before taking a short trip to Daytona Beach, where I discover I truly love the oceanside. Hotel switch day, which I learn is a lot less fun than simply staying at one place and not having to run about even more. Live and learn and such. We visit a mall in Altamonte Springs and see a little bit of the neighborhoods of Longwood and Altamonte. Having some time to kill before check-in, I take Nicole to Old Town, one of the most wonderfully seedy and unsettling tourist traps in the area. Where else can you find a disreputable knife store next to a toy store next to a giant tiki statue? We check into our glorious second hotel, swim and eat dinner by the pool, then explore City Walk, Universal’s version of a downtown entertainment complex. I awake to the worst headache of my life. There were scratch marks across my forehead from digging my nails into my head trying to relieve the pain. After sleeping through most of the morning, with some expert nursing by Nicole, I finally feel human enough to explore Universal Studios Orlando. We see pretty much everything, then eat at Jimmy Buffet’s Margaritaville at dinner, where we see the true depths of middle aged debauchery while we try to eat a giant pile of nachos in peace. Nicole’s turn to feel like death warmed over, as we journey to the Islands of Adventure park. After spending an entire day at the park, we decide we’re too tired to move, so we eat a quite dinner at the hotel’s basic dining room, and get to see Scooby Doo bother businessmen and conventioneers. On the road for 3 hours to see Nicole’s aunt and cousin in Port Charlotte. We visit for a while, and then make a jaunt to a place called The Shell Factory, which cements itself in my mind as one of the purest examples of a tourist trap I’ve ever visited. Then a short visit to another beach by the ocean, Ft. Myers, where Nicole grabs shells as I take beautiful photos of the sunset. Time to return home after sleeping at Nicole’s aunt’s house. Nicole begs and pleads to stay the entire way back to the airport. What proceeds is a long, tiring travel day, ending with our triumphant return to our apartment, which inexplicably had no running water. Oh Indiana, you never miss an opportunity to make us curse you.